Note: This track is really advanced. Only join if you have at least intermediate modelling skills. 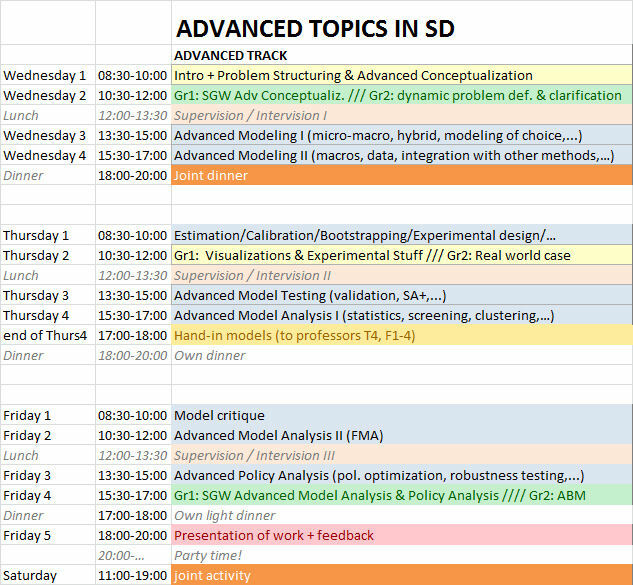 In the advanced track, experts will share their state of the art work, from hybrid modelling to eigenvalue elasticity analysis. The advanced track will be lectured by several experts: Hazhir Rahmandad and Navid Ghaffarzadegan (Wed3, Wed4, Th1), Tushith Islam (Th2 Group1), Yaman Barlas & Gonenc Yucel (Th3, Th4), Christian Kampmann (Fr1, Fr2), Andrew Ford and Erik Pruyt (Fr3), and Gonenc Yucel & Emille Chappin (Fr4). Since this teaching team consists of many experts, there will also be a general assistant: Sibel Eker asssits the lecturers.